Courthouse architecture in the United States has seen a recent surge of inspiration. Developed from the Government Services Association’s (GSA) Design Excellence Program, many of the following courthouses were chosen for this list based on their innovative design solutions as well as their modernized reinterpretations of classic Jeffersonian federal architecture. All of the subsequent structures have received numerous awards, not only from the GSA, but from local and national architecture and design associations. Many of the older buildings featured have undergone historic preservation and renovation, and those with recent completion dates showcase modern sustainability with a nod toward the classic American courthouse style. After reviewing dozens more candidates, here are our top 30 most architecturally impressive courthouses in the U.S. 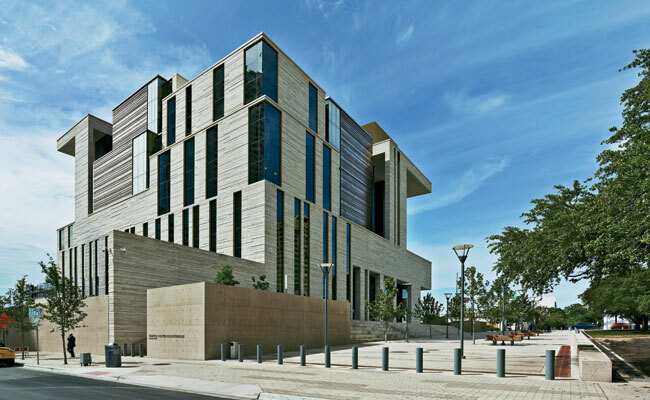 Designed by Mack Scogin Merrill Elam Architects, the United States Courthouse in Austin, Texas occupies a full city block and holds top honors from the 2014 GSA Design Awards Jury. Utilizing cubic formations to represent the intricate continuity and durability of the judicial system, the building contains four floors and 230,000 square feet. Home to courtrooms, jury deliberation rooms, and public spaces, Austin’s United States Courthouse also provides ample natural light and stunning views of Republic Square. The building has been awarded numerous accolades including the 2008 General Services Administration Citation in On-the-Boards Architecture. Twenty-two stories high, the Carl B. Stokes United States Courthouse stands as the current landmark of Cleveland, Ohio’s stunning city skyline. Winner of the 2002 American Architecture Award and a citation from the 2006 GSA Design Awards, the 726,000 square foot building was designed in a postmodern style by Kallmann McKinnell & Wood. Completed in 2002, the courthouse is named for prominent Cleveland mayor Carl B. Stokes, and is adorned with the Cleveland Venus, a 37-foot tall bronze sculpture by world renowned artist Jim Dine. Winner of the 2008 Mary Johnson Award for historic preservation and restoration, the Jefferson County Courthouse in Uptown Port Townsend, Washington was originally built in 1891. Standing above Port Townsend Bay, the building’s sturdy Romanesque style, smooth red brick, and 124 foot tall clock tower were designed by W.A. Ritchie. Opened in 1910 and designed by Arnold L. Brunner, the Howard M. Metzenbaum U.S. Courthouse in Cleveland, Ohio was extensively renovated in 2002, and renamed for U.S. Senator Howard M. Metzenbaum in 1998. Featuring 42-foot tall Corinthian columns in a neoclassical style, the courthouse was awarded LEED certification in 2013 and a B.O.M.A. Award in 2010 for Office Building of the Year (T.O.B.Y.). Added to the National Register of Historic Places in 1974, the building also features a number of important sculptural works including Jurisprudence, by Daniel Chester French. 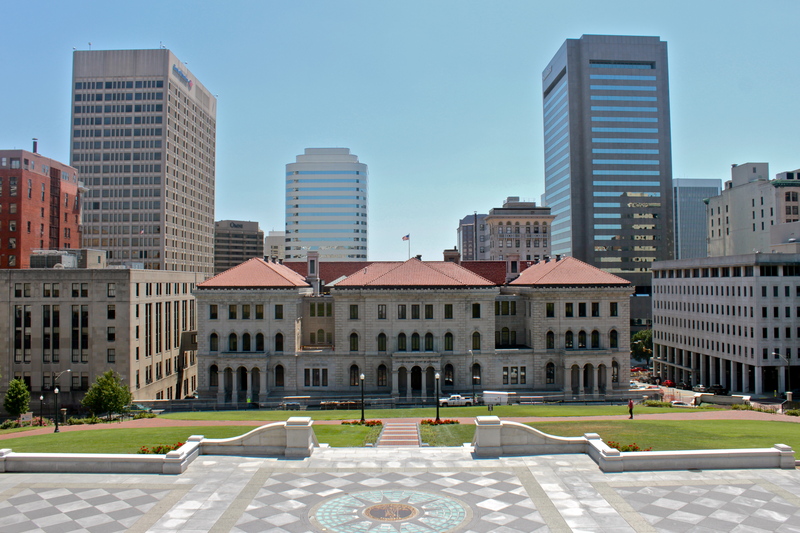 Originally designed and built in the middle of the 19th century, the Lewis F. Powell Jr. United States Courthouse in Richmond is the oldest courthouse in the GSA’s catalog. Architect Ammi B. Young created the original steel, granite, and limestone structure in an Italianate style that currently houses the 4th Circuit Court. Marked by arches and granite steps, the building was added to the National Register of Historic Places in 1969. Currently located in Richmond’s Main Street Banking Historic District, the courthouse is a landmark of historic American democracy. Named in honor of Senior Judge of the United States District Court for the District of Nevada, the Lloyd D. George United States Courthouse and Federal Building is one of only three buildings in the country to receive the GSA’s Honor Award for Architecture under the Design Excellence Program. Also awarded a Citation for Design Excellence by the AIA Committee on Architecture for Justice, this modern, light-filled beauty was designed through collaboration between CannonDesign and Harry Campbell Architects. Completed in 2002, the courthouse is the first federal building to comply with post-Oklahoma City blast requirements. Designed and completed in 2013 by Richard Meier and Partners of New York, the San Diego Federal Courthouse links both new and existing buildings, and stands sixteen stories high. Utilizing Meier’s signature white facade infused with terra-cotta and glass, the Mediterranean-style courthouse sits along the western edge of San Diego’s thriving downtown. Winner of a National Architecture and Engineering Award from the American Institute of Steel Construction, the building also holds LEED Gold certification from the U.S. Green Building Council. The project has also won an Award of Merit from ENR California’s Best Projects Competition in the Government/Public Building category for 2013. Winner of the GSA’s competition to design a new courthouse for Eugene, Oregon, Morphosis architects created the first federal courthouse in the United States to achieve LEED Gold certification. With bands of curving steel and a large glass atrium, the design has also been awarded Architecture’s AIA/COTE Award and a Top Ten Award for 2007. Energy efficient features include ample use of natural light and the inclusion of drought resistant native species throughout the courthouse grounds. The five-story tall structure also includes artwork by Matthew Ritchie, and additional sustainability features include low-VOC adhesives and sealants and the reduction of potable water by 40%. On track to receive LEED Gold certification from the U.S. Green Building Council, the John M. Roll United States Courthouse in Yuma, Arizona has also received a 2014 GSA Design Award as well as an ENR Southwest Award of Merit for Best Government/Public Building. The contemporary Southwest-inspired design was completed in early 2014 and by Erlich Architects. Sandstone and glass combine with exterior “living walls” covered with vines to facilitate natural window shading. A commemorative piece, named for federal judge John M. Roll, the courthouse designers also worked to enhance the building’s interior natural lighting while keeping the harsh Arizona climate in mind; the use of canopies and shaded curtain walls keep out solar glare. 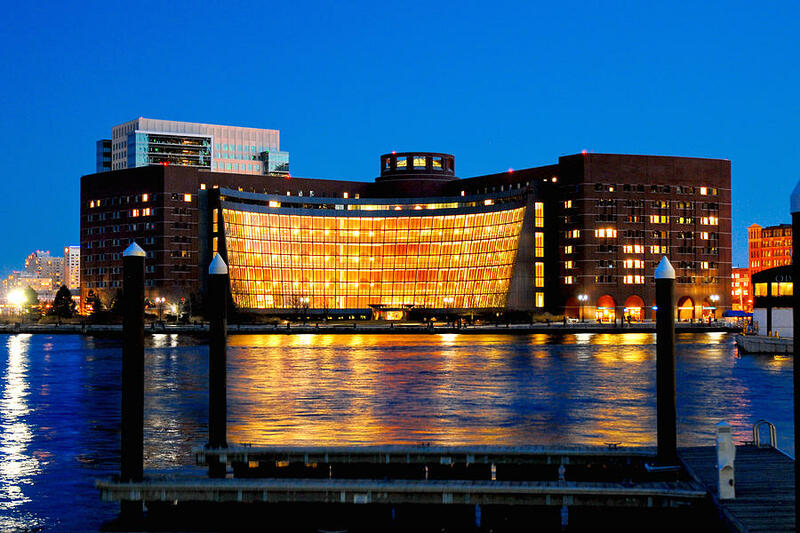 Fusing brick and glass together, architects Pei Cobb Freed and Partners completed Boston’s John Joseph Moakley United States Courthouse in 1999. Located on the Fan Pier on the Boston Waterfront, the design has been given numerous design awards including the National Endowment for the Arts’ 2000 Presidential Design Award for Federal Design Achievement, the 1999 AIA District of Columbia Chapter Award of Merit, and Safelex Safe and Sound Award for the First Annual Award for the Use of Laminated Glass in Design. Built during a nation-wide boom in public building projects, Portland’s Mark O. Hatfield U.S. Courthouse won a 1994 GSA National Honor Award and exceeded Oregon’s Energy Code upon completion in 1997. The cantilevered roof contains a small green area, which is visible from the city street below, and the glass and steel structure overlooks the Plaza Park Blocks downtown. Designed through collaboration between New York’s Kohn Pedersen Fox Associates and Portland’s BOORA Architects, the courthouse adds a contemporary glamour to Portland’s skyline. Creating a comfortable and secure environment, designers included an open-air rooftop terrace and ample opportunity for natural light to cascade through the building’s glass facade. Consisting of a giant glass atrium and a glass-lens ceiling designed by James Carpenter, the Sandra Day O’Connor United States Courthouse stands six stories tall as was initiated as part of the GSA’s plan to bring great design to public building projects. The atrium, a key feature of the courthouse design, brings ample natural light to the building’s interior. Designed through collaboration between Richard Meier and Partners and Phoenix-based Langdon Wilson Architecture, the courthouse was completed in 2000 and has received a GSA Citation for Design. Recipient of an Honor Award from the GSA in 2014 and also honored by the New York Landmarks Conservancy with a Chairman’s Award for historic restoration, the Thurgood Marshall United States Courthouse was originally built in 1936. Located in the once notorious Five Points neighborhood, architects Cass Gilbert and Cass Gilbert Jr. were asked to create a monumental structure reflective of the tenets of American democracy. The giant staircase and ten Corinthian column facade was one of the first federal skyscrapers constructed. Recently fully restored to its original grandeur, the courthouse was put on the National register of Historic Places in 1987. Awarded Best Public Project by Correctional News, Los Angeles County’s Governor George Deukmejian Courthouse in Long Beach was completed in 2013 and designed by AECOM. The five-story structure is on target for LEED Gold certification, and has received numerous accolades including a National Merit Award, a Western Pacific Regional Award and a Design Excellence Award from the Design Build Institute of America (DBIA). The striking 545,000 square foot courthouse is composed of a large glass atrium with an overhead pedestrian bridge. The Los Angeles Business Journal gave the building a Commercial Real Estate Award for the Best Public Project of 2014. Originally built in 1932, the Wichita U.S. Courthouse was recently renovated and upgraded to allow for improvements in energy efficiency and sustainability. Winner of the 2014 Federal Energy and Water Management Award, improvements to the modern Art Deco-style building include digital lighting timers within the parking facility and strategically placed LED lighting. Restored to preserve its original historic character, SFS Architecture worked to clean and repair the exterior stone facade, completely renovate the existing judge’s chamber, and replace the original glazed windows with insulated glazing units. Designed by Antoine Predock Architects, winner of the AIA Gold Medal in 2006, the El Paso U.S. Federal Courthouse was completed in 2010 and has received LEED Silver certification from the U.S. Green Building Council. Standing as a rugged monument to the Southwest, the facility’s design combines local Texas limestone and copper with a glass entry lobby. Predock also included Energy Star products, computerized heating, and efficiency window glazing to improve energy costs. The project has also received the Texas Downtown Association President’s Award for Best New Construction, and showcases stunning views of Mount Franklin. Image SourceWinner of numerous accolades including the Green Good Design Award from the Chicago Athenaeum and the Next Los Angeles Merit Award from the AIA Los Angeles, the new United States Courthouse in Los Angeles is set for completion in 2016. A giant serrated glass cube, designed by Skimore, Owings, and Merrill, LLP, the facility will seek LEED Platinum certification upon completion and includes sustainability features like water efficient fixtures, an advanced irrigation system, and a sky-lit central courtyard to provide natural light. The building’s north south orientation ensures maximum daylight exposure while simultaneously reducing cooling costs and solar heat gain by fifty percent. Completed in 2012, the United States Federal Courthouse in Bakersfield (tentatively named the Village Green Courthouse) overlooks the Mill Creek Park and stands as a modern landmark to traditional courthouse architecture. Designed by NBBJ Architects, the facility has been awarded multiple citations including an ENR California Award of Merit, and GSA Design Award Citation, and numerous recognitions from the AIA Justice Facilities Review. The sophisticated glass structure has also received LEED Gold certification from the U.S. Green Building Council. Intended to pay homage to the long established “courthouse on the village green,” a tenet of American design, the courthouse also nods to California’s modernist architectural history through its use of clean lines and glass. 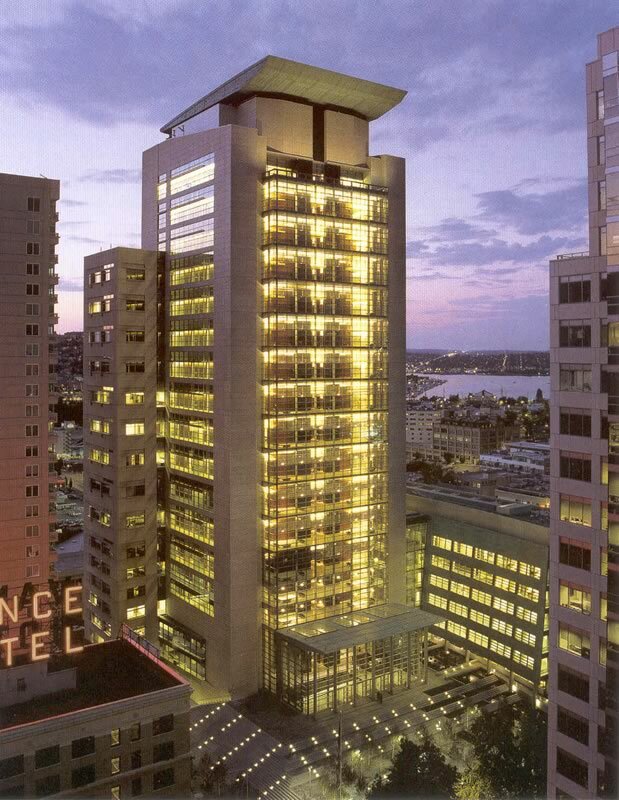 This 23-story tower, designed by NBBJ, was the first in the nation to include universally sized magistrate and district courtrooms. Innovative for its hybrid shear wall core, which increases the facility’s overall seismic safety, the United States Courthouse in Seattle also showcases a light-filled glass tower, intended to represent the transparency and order of the U.S. judicial system. Winner of three GSA Design Excellence Awards, the structure also received and Award of Merit from ENR California, an Honor Award from AIA Pacific Northwest, and a Citation from the National Center for State Courts. Designed by NBBJ of Seattle, Washington, the James F. Battin United States Courthouse was completed in 2012. Achieving LEED Gold certification as well as a 2013 GSA Design-Build Award for Civics Buildings, the classically inspired courthouse features four key design concepts including federal expression, regionalism, visible justice and high performance. A grand interior staircase showcases views of downtown Billings and the Beartooth Mountains, and leather and walnut details throughout the structure nod to Montana’s rustic history. Each courtroom features natural light and regional materials as well as Montana Yellowstone. The building has also attained a 44% reduction in overall energy use compared to similar building projects. Rich in history, the second Pinal County Courthouse was recently restored to its original Victorian Revival specifications. Originally built in 1891 and designed by James M. Creighton, the courthouse was named Public Works Project of the Year in 2014, and has also earned the prestigious Governor’s Heritage Preservation Grand Prize Award. Once in a terrible state of disrepair, the structure has been meticulously resurrected through collaboration between Swan Architects and ARCADIS. Placed on the National Register of Historic Places in 1978, the courthouse is Arizona’s oldest public building. Image SourceOn target to become the first building on the National Register of Historic Places to achieve net-zero status, the Wayne N. Aspinall Federal Building and U.S. Courthouse was originally constructed in 1918, and has recently been fully restored. The building’s recent upgrade has afforded it many awards including an Honor Award for Built Architecture by the AIA Colorado, a Best Renovation/Restoration Project from ENR Mountain States, and an AIA COTE 2014 Award for Top Ten Green Projects. Located in Grand Junction, the facility’s sustainability features include low flow fixtures, low impact landscaping, and a 32-well geothermal system to facilitate heating and cooling. Image SourceWorking in conjunction with local Long Island firm Spector Group, Richard Meier and Partners designed the Alfonse M. D’Amato United States Courthouse. Completed in 2000, the project is the third largest federal courthouse in the United States, and showcases Meier’s signature white building style. The 11-story 850,000 square foot giant presents a stunning conical drum entrance complete with a top-lit rotunda, intended to inspire those working inside, and the breathtaking panoramic views of Great South Bay and Fire Island have earned the structure a coveted Archi Award. Designed by Moore Ruble Yudell Architects and Planners, the Robert E. Coyle United States Courthouse is Fresno’s tallest building. The nine story structure is composed of pre-cast concrete in a Brutalist style that references the surrounding Sierra Nevada Mountains through its use of shapely sculpted elements. Covering 400,000 square feet, the courthouse also features a public garden that can be viewed from the lobby. The project has garnered multiple awards since opening in 2005 including the 2007 GSA Design Excellence Honor Award and a 2006 Chicago Athenaeum American Architecture Award. A striking addition to Buffalo’s skyline, the Robert H. Jackson U.S. federal Courthouse was completed in 2011 and designed by Kohn Pedersen Fox Associates. The facade incorporates and enormous glass wall that glitters and shines as daylight moves across it. Located on the northwest corner of Niagra Square, the courthouse design utilizes local and recycled materials to create and enormous elliptical form. Containing over 280,000 square feet, the LEED Gold certified facility has also received an ENR Best of 2012 Award for Excellence in the Government/Public Building category, as well as a 2011 Award for Design and Manufacturing Excellence from the Architectural Precast Association. Originally built in 1892 by Mifflin E. Bell and William A. Freret, the U.S. Post Office and Courthouse in Brooklyn New York has experience a recent renaissance upon extensive restoration. Beginning in 1999, Kliment Halsband Architects worked to renovate the Romanesque building by rejuvenating the structure’s original marble details and ensuring the four story atrium brought adequate natural light deep into the space. The courthouse has been awarded a 2008 GSA Preservation Design Honor Award, a 1999 GSA Design Award, and a 1999 AIA New York Certificate of Recognition. The structure was added to the National Register of Historic Places in 1974. Overlooking an enormous green space, the limestone facade and sweeping symmetry of the United States Courthouse in Hammond, Indiana, mimics the flat midwestern prairie. Designed by Pei Cobb Freed and Partners and completed in 2002, the facility continues to gain accolades for its sustainability features and striking placement against the plains. The courthouse has been recognized by the GSA with an Honor Award for Design, a TOBY Award in the Earth Category, and LEED Silver certification from the U.S. Green Building Council. World-renowned artist Dale Chihuly created four blown glass and aluminum sculptures for the facility’s interior. Designed by H3 Hardy Collaboration Architecture, the U.S. Federal Courthouse in Jackson, Mississippi was intended to replace the original 1930s-era James O. Eastland U.S. Courthouse. A stark contrast to its At Deco predecessor, the new facility houses twelve courtrooms and sixteen judges chambers, and was created under the GSA Design Excellence Program. The 400,000 square foot courthouse consists of three distinct pieces featuring an open air rotunda surrounded by two large six-story volumes. Jackson’s stunning new courthouse received the 2012 Region 4 Phoenix Award at the 15th National Brownfields Conference. Completed in 2012, the Cedar Rapids U.S. Courthouse was designed by OPN Architects. Hoping to achieve a visually and physically inviting space for the nineteen government agencies housed within, designers created a light-filled structure that received a GSA Design Award in 2010. LEED Gold certification was also awarded to the project and sustainability features include blast-resistant glazing, solar panels, rain harvesting, and a green roof. Located along the Cedar River, the courthouse also houses a History Center with exhibits and interactive displays, as well as artworks by Ellen Wegener and Julie Moss. With a look toward the past and the future, Safdie Architects created one of the most provocative and compelling examples of the unlimited potential of public architecture and design. A curved colonnade entry hearkens back to the nation’s rich architectural past while simultaneously bringing federal design into the future. Featuring a 200-foot mural by world-renowned artist Sol LeWitt as well as stunning views of the site’s heritage trees, the United States Courthouse in Springfield was completed in 2008 and was awarded a GSA Design Award in 2009. Sarah Nawrocki is a freelance writer and artist living on the edge of the Great Basin in Central Oregon.